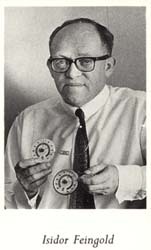 In 1943 Isidor Feingold, a trained glassblower, started the enterprise which was to be the foundation of the present company, Termometerfabriken Viking AB. The thermometers were produced manually, the cappilaries were handblown and attached to a scale printed on a straight wooden or metalplate. Later Isidor Feingold adapted the bimetal spring for thermometers and the round thermometer was born. The son, Sigurd Feingold, took over the business in 1976 and continues the expansion with a powerful digital programme and increased export. in 2000 the total turnover was SEK 50 million (appr. USD 5 million), 50% being export.